← The Mother Earth News Fair is this weekend! I’m trying something new this year to protect my apple trees from pests — nylon socks! I’m not a big fan of spraying my fruit trees. Even with the most organically friendly materials possible, spraying is a pain and I don’t usually get around to the task at the right time. Plus, you have to have a nice sunny, but not windy, day to spray and that doesn’t always happen when I need it to. So, I was poking around the City Fruit site and found link to another site with information about using nylon footies to protect fruit from coddling moth. What the heck, I thought, I’ll give it a try. I ordered nylon socks and orthodontic elastic bands in bulk from eBay. When it was finally time to start putting the socks on, I was worried it would be a huge pain, but I worked out a system pretty quickly and found it wasn’t much of a pain at all. In fact, since I have to thin the fruit on the trees anyway, it just added one more step to thinning process. I did leave some of the fruit on the apple trees unprotected (as a control) and we’ll see if the nylon socks make any difference at all. Here’s to pest-free (hopefully) fruit! 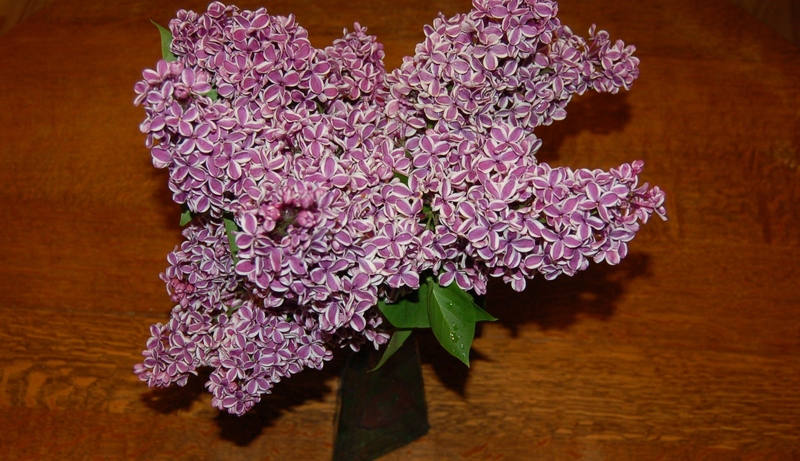 I’ll end with a shot of my favorite lilac. It’s deep purple edged in white and smells wonderful. I love it and the bees do too. This entry was posted in Gardening and tagged apples, coddling moth, lilac, nylon socks, pest control. Bookmark the permalink. I am glad you left a few uncovered just so you have something to compare too. It will be interesting to hear your report back on this at the end of the harvest season. I think this is a very sensible solution for home orchards which are working on a small enough scale that mechanical barriers like this are practical and effective to use.